The moment you enter the front doors of BreadFruits Taman Desa, your eyes are treated to a burst of color. Carefully stacked local and imported fruit line the shelves: guava, Asian Pear, grapefruit, apples, passion fruit, lemons, pomegranates, oranges… all fresh, visually pleasing, and ready for sale. Beyond the fruit are jars and jars of honey, wild honey, collected from the jungles of Malaysia. For those with a sweet tooth, try a tiny spoonful from each sampling jar. Whether you chose to sit inside or on the outdoor covered balcony, the ambiance is bright and airy, simple and comfortable. Breadfruits offers natural, healthy, genuine food made from locally sourced ingredients. A full menu of is available including breakfast, lunch, dinner, and, of course, brunch. Brunch: a portmanteau of breakfast and lunch, a meal combining the best of both worlds. Often described as “a late breakfast”, other times ”an early lunch.” Most agree brunch is filled with comfort foods, meant to be savored, never hurried. 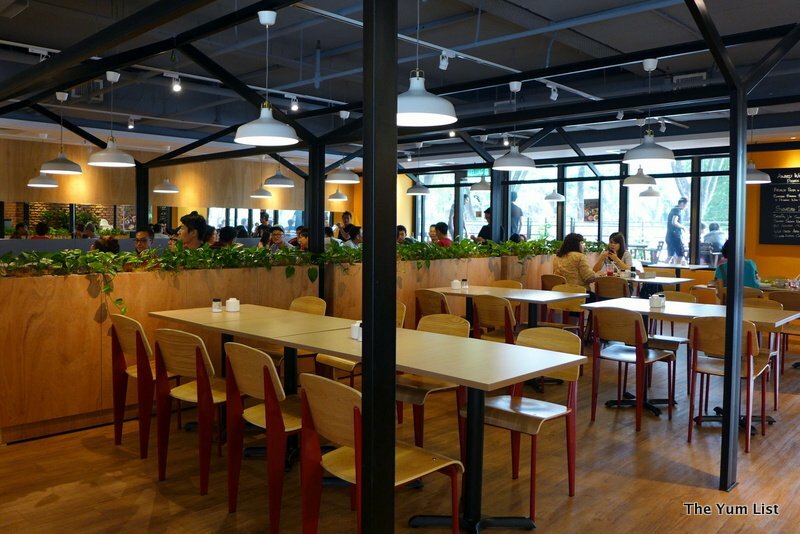 Whatever your definition, Brunch is just one thing at BreadFruits Café: DELICIOUS!!! Co-owners Melvin and Kah Kwan (KK) have put together a new Breakfast and Brunch menu filled with creativity and flavor, and together with The Yum List crew I was fortunate to sample it. 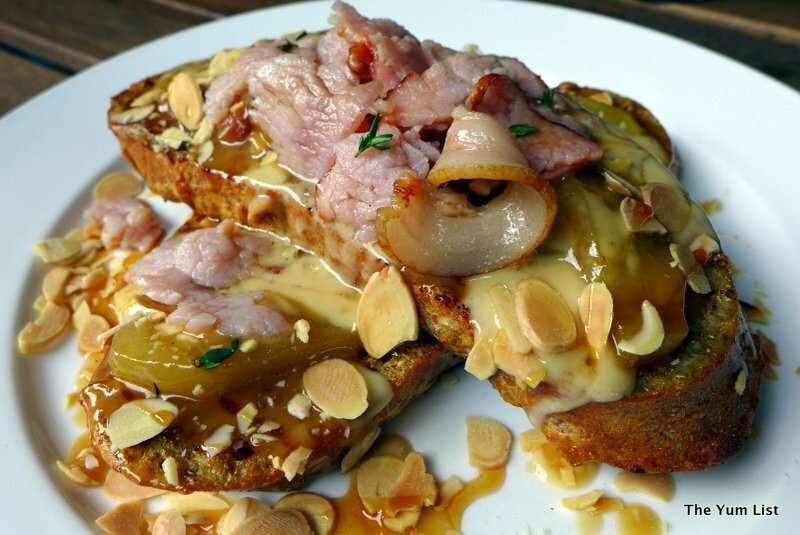 Wild Honey Apple Pear Rye French Toast is comfort food to the max. Take two slices of perfectly cooked rye bread French Toast, cover with homemade Wild Honey Apple Pear Sauce, pile on top bacon, honey cream, herbs and spices, sprinkle with almond slices, and you have the makings of a luxurious, lazy brunch. This dish is almost sinful it is so good. 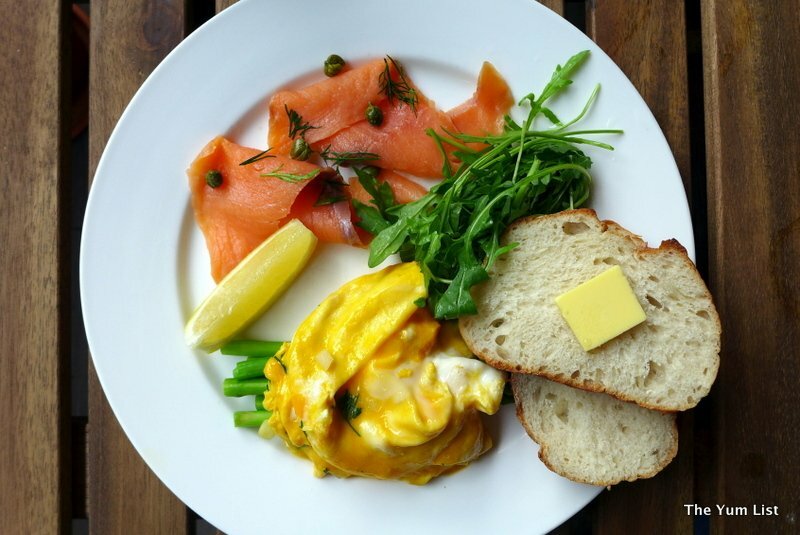 Smoked Salmon and Asparagus with Dill Scrambled Eggs show just how well salmon and eggs go together – like chocolate and strawberries, spaghetti and meatballs, peanut butter and jelly – each is good on its own but even better in unison. Elevate the pairing with fresh asparagus, a slice of lemon, capers, arugula and toast, and together you have a classic brunch dish. 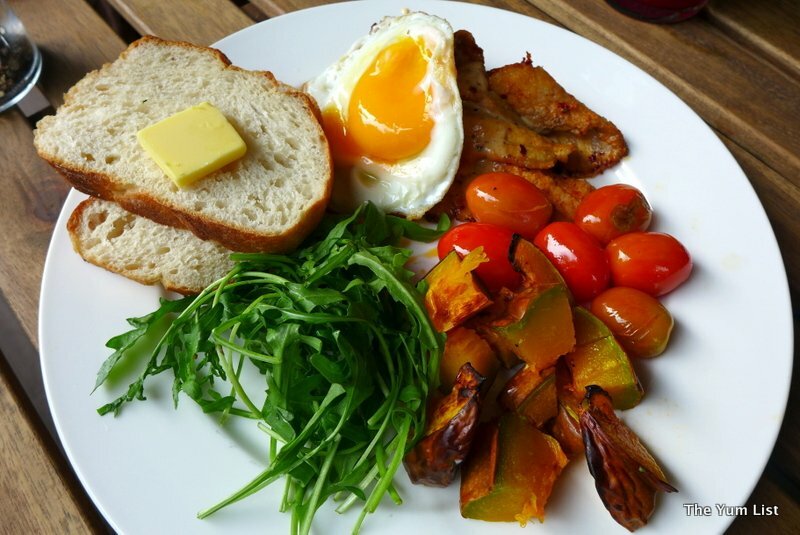 Spanish Pork Belly and Pumpkin Breakfast Plate features sweet roasted pumpkin and paprika marinated pork belly, which marries expertly with creamy harrisa sauce, sunny side up egg, roasted cherry tomatoes, arugula and toast. It is a harmony of flavors guaranteed to satisfy any late morning hunger pangs. When I first saw the combination of Bacon and Guacamole Egg on Toast, I wasn’t sure it would work. Whole wheat bread is moistened with a slathering of fresh avocado guacamole. 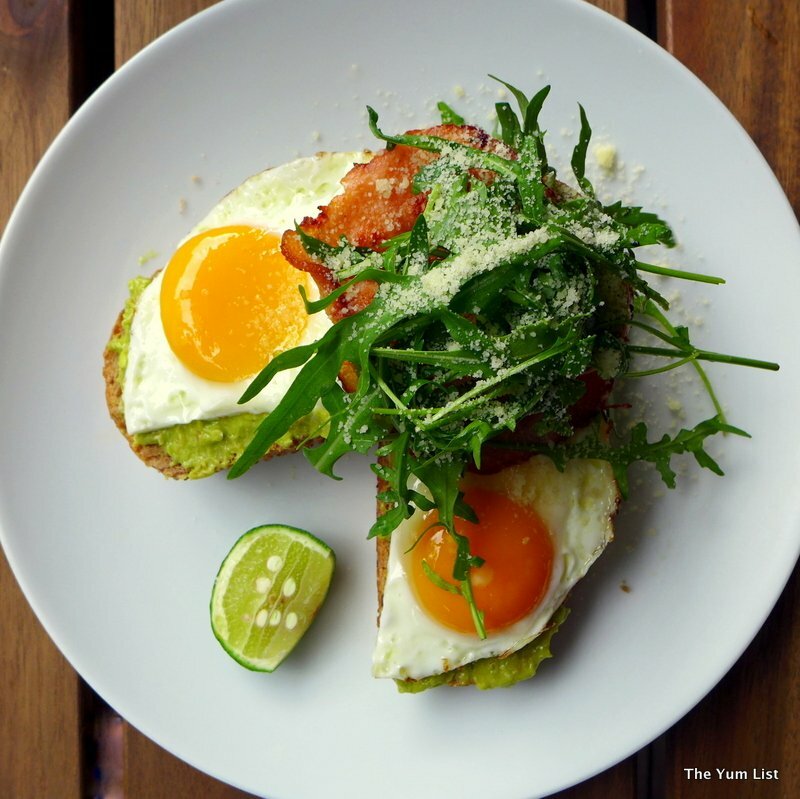 Layered on top are a perfectly cooked sunny-side-up egg, savory bacon and arugula. When the egg yolk runs over the bread and guacamole… magic!!! It’s both creamy and savory at the same time. 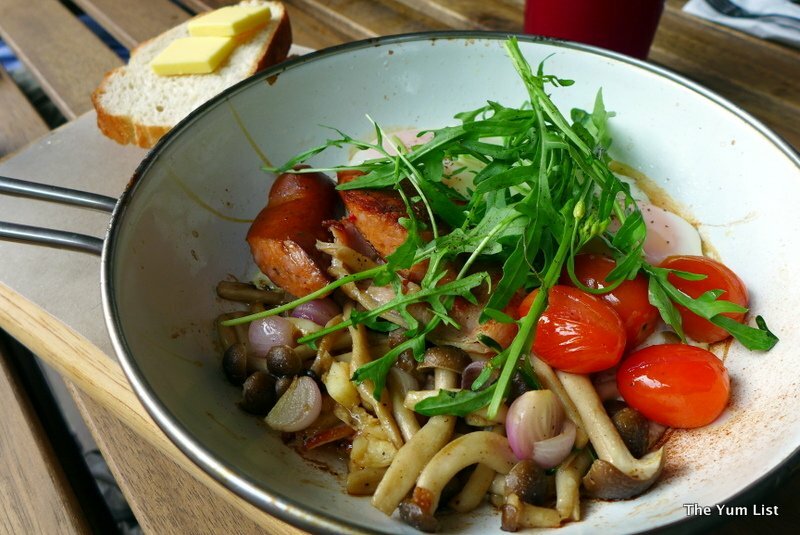 The “Baked” Breakfast is served on a piping hot skillet, and combines pork sausage, bacon, sunny side up egg, shimeji mushrooms, cherry tomatoes, onion, arugula and toast. Described on the menu as “tastefully rich”, I couldn’t agree more. The Vegan Treehugger made Mon very happy, and highlights some of the meatless and vegetarian options that BreadFruits offers. 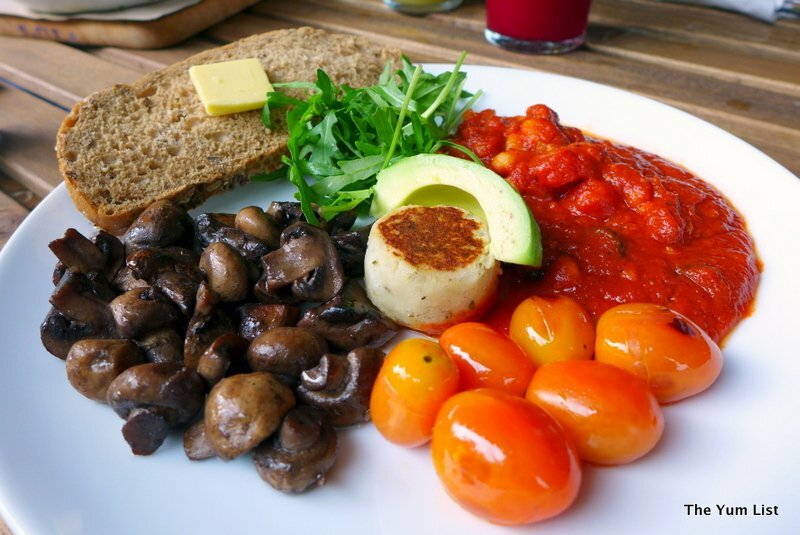 This colourful plate includes sautéed mushrooms, roasted cherry tomatoes, mashed potatoes, avocado slices, arugula and toast. The highlight of the dish however is the homemade baked beans… beautifully seasoned, tasteful and flavorful. These beans go to the very top of my “best beans ever” list: nothing like the “open a can” variety. 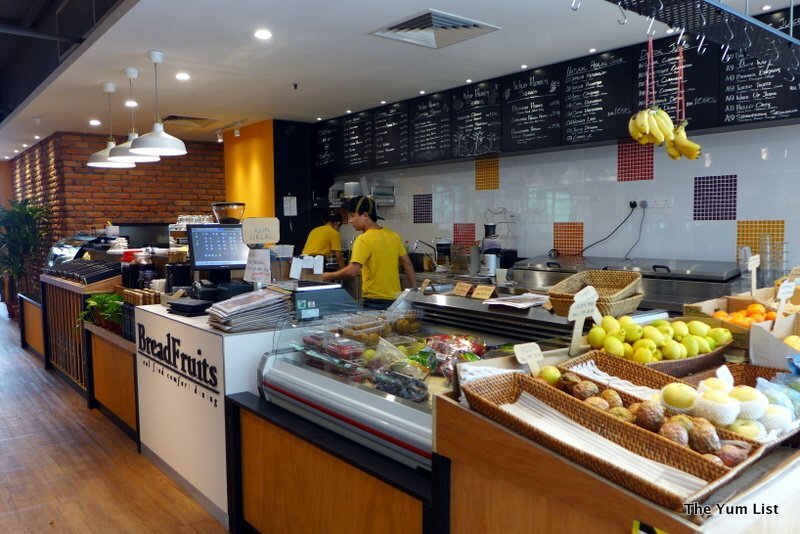 BreadFruits has a full menu of healthy and refreshing drinks. 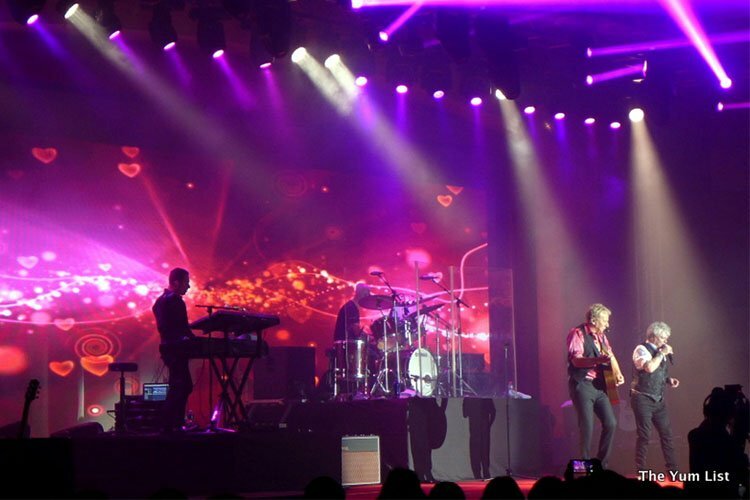 Many are infused with their signature wild honey. 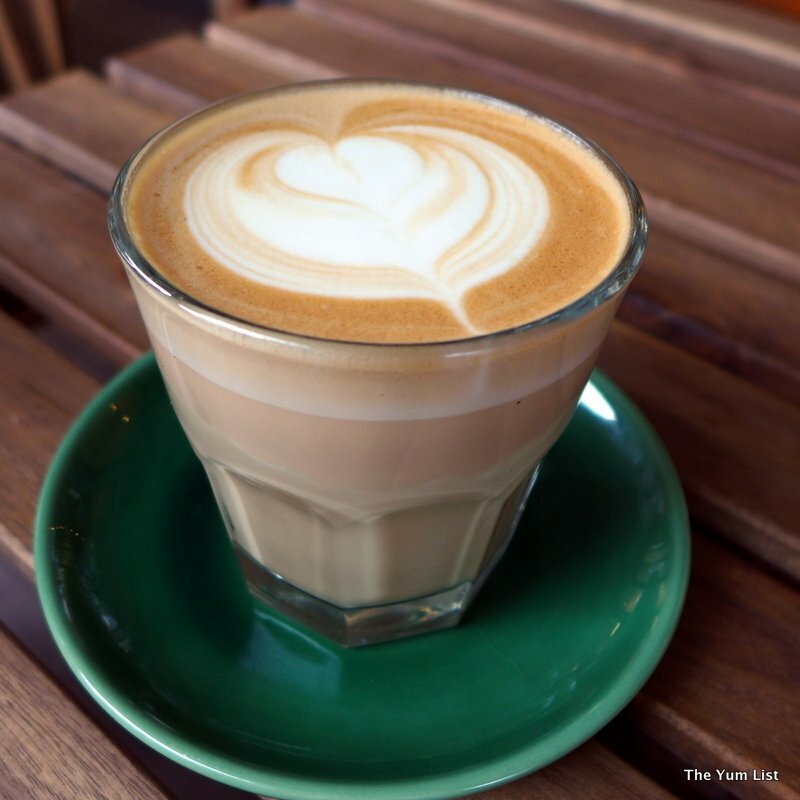 I’ve never been a coffee drinker but if served a daily cup of the Wild Honey Latte I could easily become addicted. Each sip is smooth and rich, with just a touch of sweetness from the honey. The Passion Honey drink is perfect for a hot day. Sour and sweet both engage in a battle for taste bud supremacy. Other drinks in the Wild Honey series include the likes of Mandarin Honey, Pomegranate Passion Honey, Lemonade Passion Honey, and Pomegranate Mandarin Honey. The Weight Loss, one of their Natural Healing Juices, includes juice from celery, bittergourd, guava, and apple. Liver Cleanser, from the Detox Juice selection, grabs its flavor from beetroot, celery, carrots and orange. These drinks all confirm that healthy and flavorful are synonymous. On the cover of the menu are the words, “BreadFruits Commits to Offer 100% Natural, Full Nutrient, Multi-Vitamin, Balanced Diet. Real Food Comfort Dining”. I came away from the table with a contented tummy and the feeling that everything I ate was not only delicious, but good for me. It’s hard to beat that combination. Reasons to visit: lots of nutritious and delicious choices; Wild Honey Latte; Passion Honey Juice; Wild Honey Apple Pear Rye French Toast. Looks good. I would still have to have lunch, probably about 3 to 4pm.